Home News Diminutive Dunne Continues To Stand Tall Securing Second In Spain. Diminutive Dunne Continues To Stand Tall Securing Second In Spain. 1 year ago by Bernie McGuire Comments Off on Diminutive Dunne Continues To Stand Tall Securing Second In Spain. 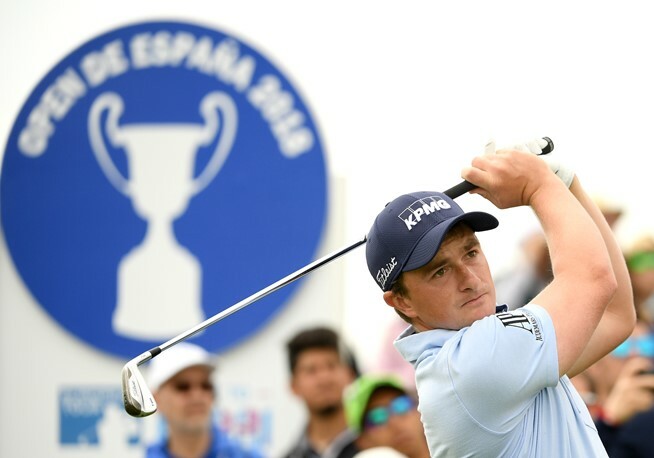 Diminutive Paul Dunne continues to stand tall in finishing runner-up in the Spanish Open in Madrid. Dunne, 25 struggled with the driver letting slip a one-shot overnight lead to post a closing day 71 for an 18-under par tally and end two adrift of Spanish sensation, Jon Rahm. An emotional Rahm won a first National Open at a first attempt signing a five-under par 67 and also playing the final hole in five-under for the four days for his 20-under par tally. Rahm joins the likes of Spanish greats Seve Ballesteros, Sergio Garcia, Alvaro Quiros and Miguel Angel Jimenez as winner of the Spanish Open. The feisty Rahm has also now captured four European Tour events, including last year’s Dubai Duty Free Irish Open, from just 17 starts. “It’s hard to describe the pride I have right now to be Spanish national champion having been a Spanish amateur champion many times with the Spanish Golf Federation, and to be able to win as a pro and do this for them and for the Spanish people, it feels great and how to describe”, he said. “It was by far the hardest Sunday I’ve ever had to play and the weight of the crowd I was carrying and I saw the willingness and the feelings as everybody wanted me to win. “They were pushing so hard and I felt that and as a golfer it is hard to deal with your emotions sometimes, and while I tried to isolate myself I could feel the emotion and used the crowd emotion”. Dunne, who now becomes the second highest world-ranked Irishman, went into the final round leading by a shot at 17-under par and with Elvira at 16-under and World No. 4 Rahm on 15-under. Dunne got off to a nervous start quickly finding himself two behind Rahm who birdied the opening two holes while the diminutive Irishman was three behind when he bogeyed the fourth. Then for a fourth day in succession, Dunne birdied the par-5 fifth and with his eagle chip shot from just off the green missing the cup my millimetres. Rahm then birdied to one clear on 18-under but dropped a shot on nine ahead Dunne parring four holes in succession from the sixth and for the duo to head to the closing nine locked at 17-under. Rahm again incurred the wrath of SKY commentators, including renowned Dougie Donnelly, for a second day running, in failing to call ‘Fore’ after a wild drive off the 10th that would lead to a chip-in birdie and take him to 18-under. Moments before Dunne, and in the final group, joined him on 18-under par in also birding the 10th. There was a two-shot turnaround when he bogeyed 11 and Rahm holed a curling birdie putt on 13, and for Rahm to move to 19-under par. But Rahm had despatched Dunne is was compatriot, Elvira who tied Rahm with back-to-back birdies at 13 and 14. Dunne bogeyed 14 but regained the shot with a birdie on 15 before overhauling Elvira to birdie the last. “I felt like I hit the ball great. Mostly my short game let me down a little bit. I hit a lot of chips that I thought were better than they were and I just kept misjudging bounces,” he said. Some of them skidded, some of them bounced soft and I feel like when I played for one I got the other result so it’s a little frustrating not to be able to get anything going, not get any putts to go in. “I hit the ball fantastic, I was hitting it long and straight, so I feel good going into the next few weeks. Obviously disappointed not to win but it is what it is. “I’m driving the ball great. For me, if I drive the ball well I feel like I have a chance to win every week. I’ll just keep doing what I’m doing. Dunne was headed to nearby Madrid Airport as the lone Irishman to join a charter flight to Morocco for this week’s Hassan 11 Trophy in Rabat. It was at the event a year Dunne lost out in a play-off to Italy’s Eduardo Molinari but he returns as the reigning British Masters champion and having produced three top-10s in as many weeks.